Andi Mills and Edie New, "The Carolina Trekkers", are riding from the California coast back to their home on the South Carolina coast. These two women made this ride to raise awareness and funding for research on strokes in women. 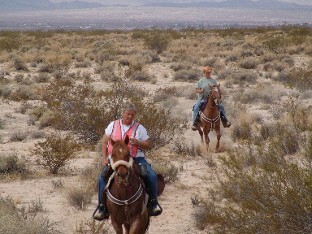 By early June they had arrived in Overgaard, Arizona, doing about 25 miles per day. "We have been having a good ride. The weather has been great and we are meeting wonderful people," Andi wrote to The Guild. Andi and Edie finished their ride after 1500 miles. For Andi, as for so many Long Riders, her life has been completely changed. Click here to read her very moving account.